Handmade and Fair Trade wooden boxes imported from all over the world. 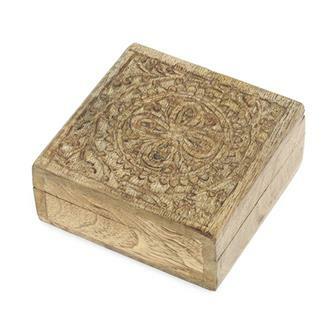 Our range includes beautiful carved Indian boxes, chunky Thai log boxes and the ingenious Balinese puzzle lock boxes. All ideal for storing your precious little treasures in! 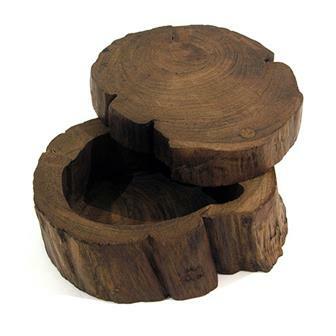 Lovely wooden box which retains the natural shape of the branch that it was sawn from. The box has had a dark wood stain and has been carefully carved out inside. Perfect for keeping little treasures in with its sliding lid and concealed hinge. A miniature version of our popular log box, this lil' fella is the perfect place to put your tiny valuables. 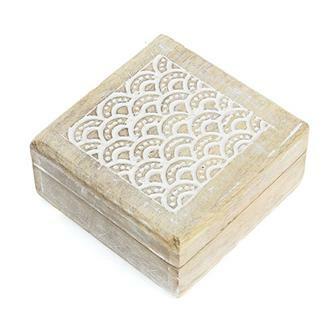 Delightful Mango wood box with whitewash from India, the lid is carved with a lovely geometric design reminiscent of the sea and fish scales. Complete with rustic metal hinges and scratch resistant feet pads. 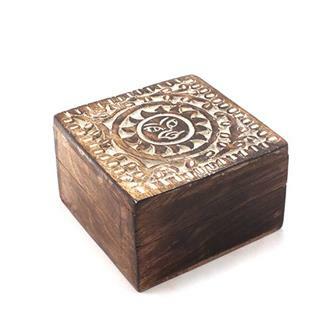 Awesome little square mango wood box from India carved with a ring of plants surrounding a flower design. Perfect for storing little treasured items in. 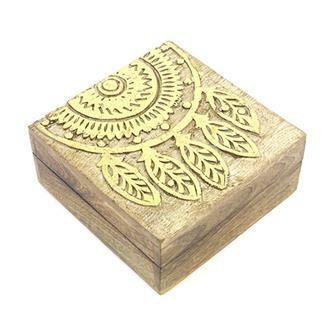 These square boxes have a splendid gold dreamcatcher design carved and painted on to the front. Perfect for storing all manner of little treasures, each one is hand made from fast growing mango wood. 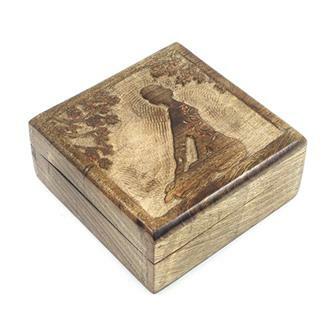 These square boxes have a decorative meditation pose carved on to the front. Perfect for storing all manner of little treasures, each one is hand made from fast growing mango wood. 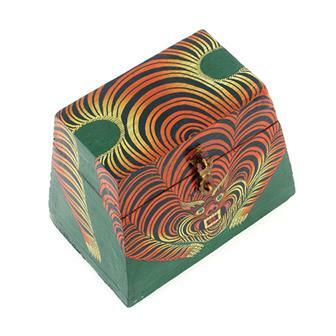 Shaped like the classic paisley tear drop and carved with an ornate pattern, these Indian handmade boxes have a swivel action. Each one is crafted from fast growing mango wood. 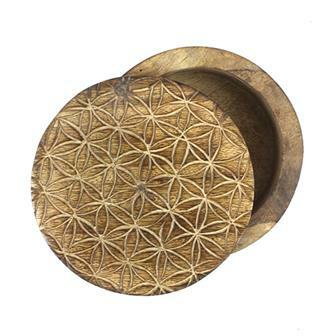 Carved with an ornate Flower of Life pattern, these Indian handmade boxes have a swivel action to open. 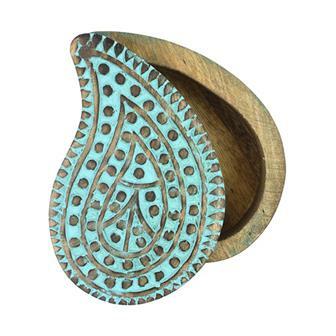 Perfect for holding all manner of little treasures, each one is crafted from fast growing mango wood. 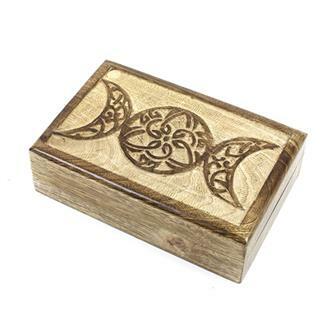 Made from fast growing mango wood, these hinged boxes feature an ornate design known as the triple goddess. Shown as three stages of the moon, the symbol represents The Maiden, The Mother and The Crone. 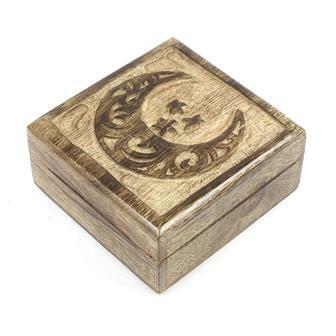 Decorated with a crescent moon, these hand made boxes are crafted from fast growing mango wood in India. 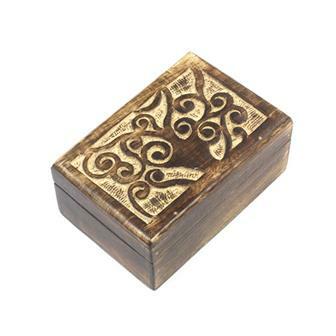 Hand carved elegant box with a tree design featuring spiralled branches. 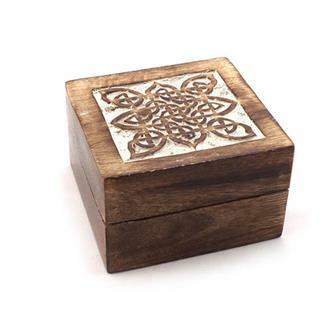 Hand carved wooden box with an intricate Celtic knot design. 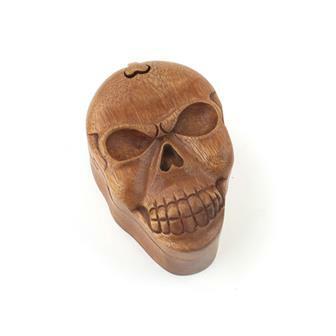 Inspired by an ancient puzzle box originating from the Hakone region of Japan, our ornate carved puzzle boxes features a terrifying skull carving and a simple three stage opening sequence revealing a small storage compartment, perfect for keeping little treasures in! 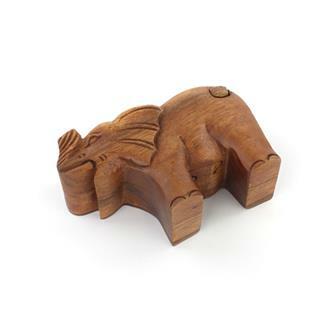 Inspired by an ancient puzzle box originating from the Hakone region of Japan, our ornate carved puzzle boxes each feature an impressive carving of a mighty elephant and a simple three stage opening sequence revealing a small storage compartment, perfect for keeping little treasures in! 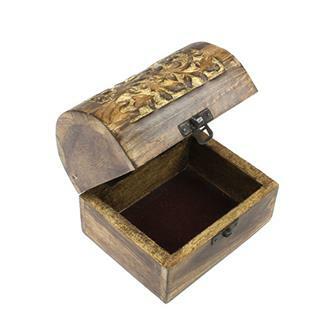 These lovely rustic chests are hand crafted in India and feature a carved flower motif. Each box is hinged and has a simple clasp. Great for storing treasure in! This wonderful Tibetan style chest has been carefully handmade and decorated in Nepal. Shaped in an unusual frustum shape, the top of the chest opens up making the box perfect for storing jewellery or other precious items. 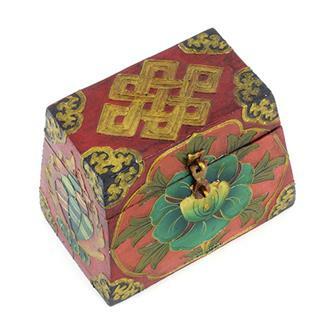 This wonderful Tibetan style small chest has been carefully handmade and decorated in Nepal. Shaped in an unusual frustum shape, the top of the chest opens up making the box perfect for storing jewellery or other precious items. 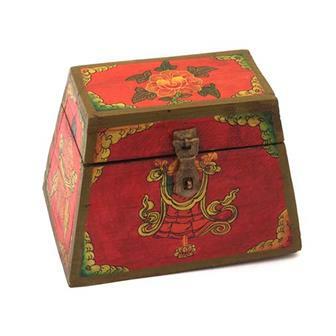 These wonderful Tibetan style small chests has been carefully handmade and decorated in Nepal. Shaped in an unusual frustum shape, the top of the chest opens up making the box perfect for storing jewellery or other precious items. 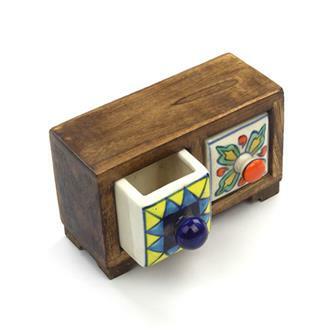 These lovely little ceramic drawers are handmade and painted in India. Perfect for storing little treasures in, the drawers also have a hidden catch inside to stop the drawers falling out.